Just want to show you how big and beautiful the pup got, what a smart and intelligent dog she is. We named her Iva and we love our giant so much! She is slim and fast, not a big eater though, cares less about food and it makes it training a little more difficult. Last March she pulled the wooden neighbors' fence and ran away. The person who caught her wanted to keep her despite that she was microchipped and he had a flyer from the local supermarket with our phone number. However, she was "good" by turning his backyard into a mine field and he decided to return her 39 days after. We put the fence next to the neighbors' fence so she won't have another chance. We didn't neuter her yet cause we would really like to give her a chance to have puppies once in her life. But it is too soon for that, she is only almost one. Just want to say thank you for the dog, she is one of a kind and nobody has any Anatolians on Long Island. 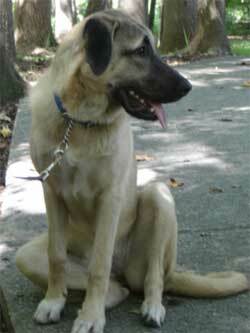 I sent a puppy to Jossito in Ponce, Puerto Rico the summer of 2008. Just to let you know that King has really become a KING. he is an outstanding dog. I moved him with all the herd to the new facilities where they have plenty of space to cover. He is always next to them when they are in the pasture, and he does not miss any one or anything slip by. He even has learn to clean the newborn kids and is very jealous of all the does. There are some of the new mothers that keep him away when they are near their babies, when they leave for the pasture he comes back to check on them. I have always been pleased with him, but now I know when you once said it was worth a lot to go through the pains of teaching him to behave with the does. I reiterate my thanks, and will always appreciate all you help through the process. people or critters of any kind he is now 10 months old probably 110 lbs or so 31"
the goats and still he only does it till he is full then he lets them have whats left. investment I have made in a long while. Just wanted to send a few pictures of Sera and let you know how she's doing. When we made the trip to RedCreek from North Augusta we were sooo very excited. 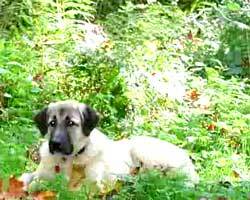 After searching the Web and everywhere else for an Anatolian we were delighted to find you and even more ecstatic to hear you still had a puppy that needed a home. When we first saw Sera at your farm my husband and I fell in love in an instant. As you can imagine several things have changed since we brought her home. She has developed such a wonderful personality she is so very loving and thinks that she is a lap dog. She keeps us laughing and smiling all the time. One thought that comes to mind is her first day with us-when we brought her home the first thing she did was to find the air conditioning vent and lay right on top of it! This is where she spent the rest of the summer. She had a couple of things to learn such as going up and down stairs (it was soo funny watching her learn how to navigate stairs) learning how to use the dog door and getting aquatinted with our cat (it was very obvious that she had never been aquatinted with cats)! We have had the best time with her she loves the water, this is fantastic for us because we live on the Savannah River and spend many hours there never once did she ever show any fear. She ran straight for the water and jumped in! As her personality continues to develop we are just floored. Here's a couple of things she loves to do. She loves to run outside when its raining and just sit on the deck in the rain. She'll come running in the house soaking wet and so excited! Covered from head to toe in mud! Another of her favorite things is to be vacuumed. Yes, I said Vacuumed! Any time we use the vacuum you can bet Sera will come running, she sits right down and waits for her turn to be vacuumed. We have also watched in wonder as her protective nature continues to develop she will step between us and any stranger. She has grown soo very much its often hard to believe that she's only 10 months old! I have sent you a few pictures just so you can see how beautiful she is and how well she is doing. 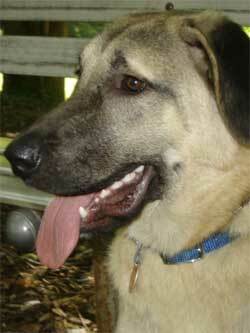 I have and will continue to recommend Anatolian's to anyone that's looking for a loving addition to their family. We have had many pets over the years but I have to say Sera has been one of the best! She is so very smart and sooo willing to please she has added sooo much to our family, she's makes us laugh and is always there to snuggle and love you. The pictures below are just a few of the most recent. 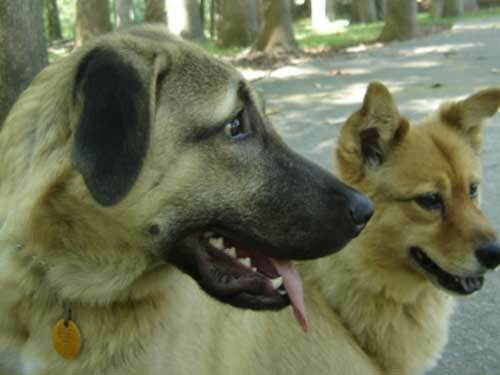 They are Sera and Sydney-notice the difference in size. Sydney is an 8 year old lab that has a lot of patience! The last picture is of Sera and her log-it (the log) started out as a tree branch and as you can see by the photo she has been working on it for a while! enjoying her a lot. So glad to have her. I haven't sent pictures of Sydney since I got her last year. She is a wonderful dog and I enjoy her every day. It is so hard to take good pictures of her because she doesn't "pose". When I call her name, she comes and that's the end f the picture-taking effort. These were taken in the park last summer. In the meantime, Sydney weighs approximately 80 some lbs. She is beautiful. I get compliments all the time ... or should I say, she is getting these compliments. We walk at the park 3 miles every day and she does enjoy this activity. She is a good rider in the car ... we go to SC to visit my daughter all the time. She behaves beautifully there with the three babies and has NEVER touched any of their toys. You know, kids leave toys around all the time. 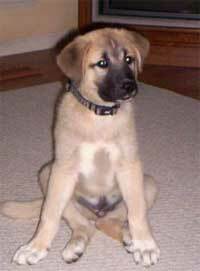 My daughter is so impressed with Sydney that her husband John gave her an Anatolian Shepherd for Christmas. (He gave her the leash and the collar). Marie told me yesterday that she will have to wait until fall , but that's alright. This dog is very much worth the wait. Casey is doing very well. We are having a lot of fun with him. He is so sweet and loving! We originally bought him to guard our livestock, but we just fell in love with him and brought him into our house. Our children have fun playing with him. He has been house broken for a while now. He is a great addition to our family. I call him a gentle giant. I know he will protect when needed though. Thanks so much for raising and breeding such fine dogs. Jeff, Lynnette, Elijah & Jonah Bell & Casey Too!! 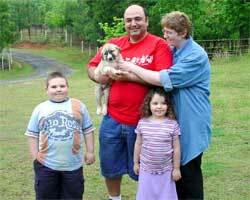 Jack Bayoglu, his wife Michele and their two kids drove down from Pennsylvania to pick up their puppy. It really made us feel good about our dogs to hear Jack say how nice they were. 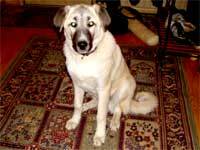 Jack is from Turkey and had Anatolians as a boy so he knows the breed well. Hey Bobbie & Danny, it's Michele from PA .
We made it home safe, Cheyenne did real well she slept most of the way home in my arms except for the occasional potty breaks, and she has already taken over the house, I took her to the vet today for her shots, and he says she is absolutely beautiful, she weighed in at 11pounds he says she is a big pup, well I will send you updated pictures as she grows, and again thank you so much. Hope all is well with you, goats and dogs. Konya is now 37 lbs and just returned from getting her rabies vaccination. She is a wonderful dog! Absolutely beautiful and at home wherever we put her. She loves the doberman and the border collies. She completely subdues herself to the sheep and goes "on guard" whenever placed in the pasture with them. She plays some with the lambs and we have not left her unsupervised yet. Whether or not she becomes the perfect guard dog remains to be seen. Still, she is destined to become my favorite dog of all time, and I have raised/owned many fine dogs. Thanks so much for saving her for me and for raising such fine dogs. Hey, Danny! We just wanted you to know that we absolutely love Griffey! He is about 40 pounds now, and is the cutest thing we have ever seen. In fact, we are sad that we got just one. You don't by chance have any left do you? Just a shot in the dark. He is an absolute joy! 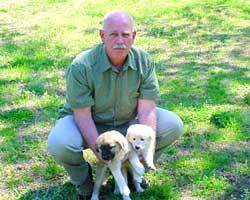 Bill Carter from High Meadows Farm in Jonesborough, Tenn. with his two females (Freya and Heidi). "They are doing great!! They definitely feel at home and [are] growing like crazy. I set them up in a barn stall, but they have a paddock area they can run in for a while. They like to follow me around while I do chores, but the weather was to hot for them the other day and wanted to run back to their stall & the shade. They are now named Freya (the fawn pup) & Heidi (the white pup). I have been taking them into the pasture with the goats on short intervals. The first time in the pups wanted to play and the goats went the other way trying to figure out what these little things were [doing] in the field. Instead of separating out a couple of young goats, I plan on taking them into the pasture on increased intervals until both of them relax and I can leave the pups there all the time. It will be a lengthly process but I believe it will be worth it. 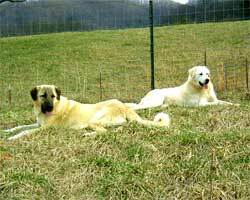 I have taken them to our Vet and she says they are the best Anatolian pups she has seen. She was very excited they had come from Working Stock instead of AKC pets. " 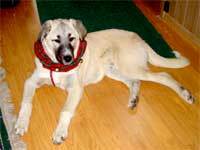 "I just wanted to send you an updated picture of Toli (we picked him up from you on Labor Day weekend this year). We are from Kentucky if you remember. Anyway, Toli is spoiled rotten! He just finished his first obedience training class and he did great. He is already fully house trained and we just love him. 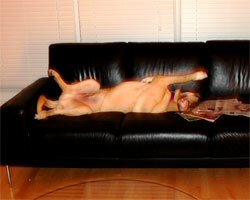 As you can see from the picture, he is leading a life of luxury!!!" Hope you both are doing well and have a Merry Christmas. 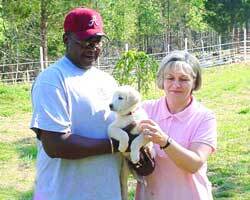 Calvin and Monika Drake from Marion, Alabama with their female pup. I wanted to let you both know how excited I am about how HoneyDew is turning out. She has been preferring to stay outside with the sheep the last few months. She often comes in at night and sleeps in my father's chair. Dad use to love that chair too! This last Wednesday, April 12th, '06, I got a frantic call from my husband as soon as I arrived at work. Our sheep had been attacked and it looked like we were going to lose the youngest ewe who had lambed a week before. I rushed home to help save the ewe. It was a long day. We had other ranchers with us, Fish & Game and a tracker who handles the local area. THERE IS NO DOUBT TO ANY OF US THAT OUR EWE WOULD HAVE BEEN FINISHED OFF AND HER LAMB WOULD HAVE BEEN A TASTY SNACK FOR A YOUNG MOUNTAIN LION HAD IT NOT BEEN FOR HoneyDew! I usually leave HoneyDew inside in the early morning for Don to let out. He is usually right behind me when I leave for work, going out to feed the sheep. For some reason this morning I decided that even though it was barely light it would be good to leave HoneyDew in the yard with the gate to the pasture open. She had been showing such progress with the flock, especially since the baby lamb, a little girl had been birthed. They were all getting on well and I decided to let her learn more about her job since she seemed to be so content with her duties. Don & I are forever grateful for that decision. She ran off the lion. As the ewe lay bleeding she took the lamb and watched over it, carrying it in her mouth when she couldn't get it to cooperate. The lion got a swing in at the other ewe who was expecting. Our ram remained untouched. We found the tracks but it was too late once the tracker got there. The constant rain/snow had faded the track. Besides I live IN TOWN in this small rural valley. We are a town of 2,000 and are completely surrounded by wilderness, Federal & State Parks and BLM lands. I couldn't be given a permit to shoot the lion because the property is zoned residential. The tracker couldn't track the lion outside of my yard in the wilderness about a 100yds away because of the way the law is written! We now have an enclosed sheep shed inside the pasture thanks to the good hearts of my neighbors and surrounding sheep ranchers. It went up in 24 hours. The first night I kept the ewe and her lamb in the house by the heater, tending to her. I also rearranged our shed which holds feed and tools. I placed the ram and our less injured ewe inside the shed, Brandy was now full on into labor. I was not about to leave Brandy outside so that when the lion came back in the early light of morning he'd have a new snack. Since I didn't want to break the law, I secured the ram and ewe in the shed and put HoneyDew out to keep watch. Watch she did and the ewe gave birth to our second lamb, a male. The mountain lion was sighted two days before the attack by the neighbor behind me. He went outside to quiet his dogs and saw the lion walking down the middle of the road! I remember our emails as I decided to purchase HoneyDew. What a blessing she is! She has great breeding and is of correct temperament and confirmation for the show ring. She is huge and growing daily. 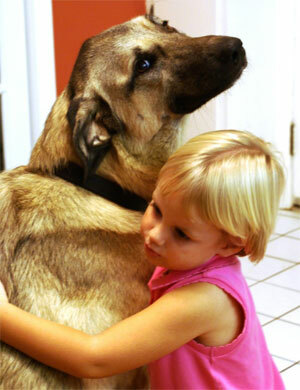 The night before the attack we were grooming her in our house, loving on her and telling each other what a truly wonderful dog she was turning into. She has learned so much over these months and continues to be a real joy. Our daughter and 17 month old grandson had just come for a week to visit. Daniel just loves HoneyDew who has visited him in mommy & daddy's apartment. Daniel litterly pulled on her whiskers and lip and she never flinched, growled or retreated. Instead she was calm, silent and patient. Daniel even laid on her as his pillow when she laid in front of the wood stove to warm herself. I look forward to watching HoneyDew grow and develop into an adult. Eventually I will show her as I planned, and am so pleased that she will be a true Anatolian with the right heart and temperament for family and work! My dreams have more than come true and she's been with me less than a year! Someday she will be a wonderful mom herself and I can be confident that her pups will be true Anatolians with all the heart, beauty and stature they were meant to possess! I wanted you to know what an exceptional dog she is and how very grateful and overjoyed I am to have her as a member of our family. I'll try again to send you a couple of pics we took of her about 3 weeks ago. She's even bigger now! Another satisfied customer. 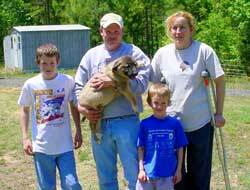 Brenda and Gary Keller drove all the way from Columbus Junction, Iowa with their two sons to pick up their male pup. Danny I can't tell you how great a dog Yurik is. It took the BC puppy about a day and a half to figure out that Yurik wasn't going to hurt him...so we have this 10lb Border Collie chasing around this 100lb Anatolian. It is adorable. We haven't seen a coyote in ages and Yurik is very protective of "his" cats. Yet, he loves the UPS guy, the power guy and the mail lady. He has socialized wonderfully. You did a great job of raising him...he's never once had to get in trouble for growling at us over anything. The vet's office just loves him. I hope you continue to breed and some day, we can get another from you with similar bloodlines. Barrett is doing GREAT. The photo was taken at 9 weeks. He has settled in really well with the 3 Corgis, horses and the 2 goats. He likes the goats the best..they just aren't quite sure about him yet. He was so happy to see them the first day here.something familiar. He was house trained in 3 days! So much faster than most dogs I've had. He comes when called.most of the time (I always carry treats). He knows sit but stay is not yet in his vocabulary. He stays right with me when I'm out around the farm and stays in the fenced back yard with my male corgi at night. I think he is going to be perfect. We really love him. Thanks again. I'll send updated pictures. He grows about an inch each night!! I hope all of your other puppies have settle into their new homes well.